James Harrison was born in Lydney on 19th January 1882, the son of a coal trimmer and fisherman. Jimmy started to play rugby there whilst still a youngster. By the age of 15 he was a prominent member of a local junior team, the Lydney Hornets, a side that enjoyed the distinction of never being beaten on their own ground. Jimmy stayed with the Hornets for several seasons, during which time he scored over 40 tries. Jimmy found employment as an apprentice colliery labourer from 1898 to 1902, whilst living with his parents at 10, Queen Street, Lydney. His talent at rugby was recognised by the Lydney club, and after a period with their Second XV, he was given a place in the premier team, playing his first match in a hastily arranged game against Gloucester at Kingsholm on 1st February 1902. Gloucester had been due to play Llwynypia, but the Welsh side cried off because they preferred to go and watch Wales play Scotland that afternoon. Gloucester took out their irritation on Lydney, and young Jimmy Harrison, by scoring 6 tries in a 22-0 beating. His only other appearance for Lydney 1st XV that season was not much easier, against Neath. The following September, Jimmy got into the Lydney team as reserve against Bristol, and after that match he played regularly on the wing. He kept that position until an injury to R J Goss necessitated his moving into the centre. He won his first Gloucestershire County Cap as a Lydney player, against Cornwall, but would win a further four county caps after he had joined the Gloucester. Having decided to try his luck with Gloucester, Jimmy did not play any games for the A team, but went straight into the 1st XV for his first game at Bristol on 12th December 1903, when Gloucester suffered a 7-0 defeat. However, Jimmy made a good impression, he immediately established his claim to a regular place in the team, and missed only one game during the rest of that season. It did not take him long to register his first tries for the Club, scoring two at Kingsholm in a 23-5 win over Cheltenham on 2nd January 1904. Later that month he went one better, and scored three in a 59-0 demolition of Coventry. Also in January 1904, he showed he had another string to his bow by kicking dropped goals against Clifton and Newport. Further tries against Bristol, Richmond (2), London Welsh, Penarth, and Northampton meant that he finished the season with 11 tries from 21 appearances, and was second only to “Whacker” Smith in the list of leading try scorers. Jimmy started his first full season for Gloucester with a startling performance in the opening match – on 24th September 1904, he scored 7 of Gloucester’s 10 tries in a 45-0 win against Old Edwardians at Kingsholm. This was only one short of the club record 8 tries scored by “Whacker” Smith in 1901, and proved to be the outstanding performance of Jimmy’s playing career. However, it seems to have made less of an impression on Jimmy than on others – when WB interviewed Jimmy in 1950 (when he was aged 68), Jimmy thought that the most he had ever scored in a match for Gloucester was 2 or 3 tries – WB had to put him right. Unfortunately, a few weeks after these heroics, Jimmy injured his shoulder, was laid up for some time, and when he resumed playing it took him a while to get back to his previous form. He scored against Old Merchant Taylors in the Boxing Day match, but had to wait until the latter part of March before crossing the line again – he then scored a brace of tries against Northampton and three against United Services. He ended the season with 13 tries from his 30 appearances, but they had been scored in only four matches. Jimmy again started the season well in 1905-06, with a try in the first game against Clifton. Before this match kicked off, the new gymnasium (now known as the Lions’ Den) was opened by the local Member of Parliament. The following month, Jimmy was in the Gloucester team which took on the All Blacks in front of a packed ground at Kingsholm on 19th October 1905. Jimmy was not fully fit (and nor was his centre partner, Hall), and he did not have the best of games, but then it was difficult for any of the Gloucester players to shine in a 44-0 defeat, and Jimmy’s main role was to make relieving kicks and defend. 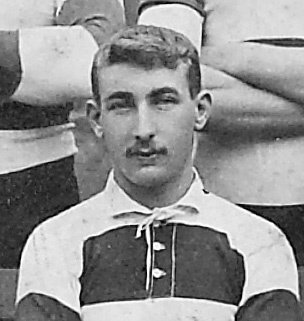 By mid-season, Jimmy had recovered his form, and scored a hat trick of tries against Leicester, in a 20-0 win at Gloucester on 13th January 1906. In successive weeks in February, he scored two tries against Penylan and three against Bream in the County Cup. Jimmy finished the season with 12 tries, having appeared in 30 of Gloucester’s 37 fixtures, during which the team scored a record 661 points (the Club’s wings, Arthur Hudson and “Whacker” Smith had remarkable seasons with 41 and 27 tries respectively). During the season Jimmy also made 3 appearances for Gloucestershire, against Glamorgan (when he scored a try), Devon and Somerset, but all these games ended in defeat, and Jimmy lost his place for the County’s final fixture against Cornwall. Jimmy scored his last try for the Club on Easter Saturday 1906, contributing to the defeat of Lennox, 30-13, at Kingsholm. Two days later, on Easter Monday, the match at Kingsholm on 16th April 1906 proved to be Jimmy’s last for Gloucester, but it was another win, 20-6, against Northampton. Jimmy Harrison may have played for the Club for only 3 seasons, but his career record for the Club was a fine 81 appearances, 36 tries, 2 dropped goals and 116 points scored. He left Gloucester to go north and join the ranks of professional rugby league with the Wigan club, where he won international honours. By the start of World War One he was back in Lydney, working again in a colliery. He answered the call of his country, and enlisted at Coleford on 1 September 1914 with his friend and fellow Gloucester player, Arthur Saunders. The Army recorded him as 5 feet 5 inches tall, weighing 145 pounds with grey eyes, brown hair and a fresh complexion. His Army service took him to the Dardanelles (where he was wounded), Egypt (where he was twice reprimanded for gambling), and to Palestine, whence he returned to the UK and was discharged in 1919. Jimmy married Emily Annie Click (1865-1956, Gloucester) at ChristChurch, Gloucester, on 31 May 1920. His funeral service was held in the same church following his death on 27th February 1956, age 73, when he was living at 1 Montpellier Villas, Gloucester; Jimmy and Emily died in the same year. James Harrison signed For Hull FC in 1906, after playing a couple of trial games he was selected to play in the first team. I have no idea of how many games James played for Hull FC however; I don’t think he was selected for any international games. The Hull Archivist has somehow not recorded James in Hull FC records. This is something I will look into and get back to you. My granddad’s brother, George Hall, moved from Gloucester to play League for Hull around 1904 and a James Harrison was in that side – but the dates do not seem to line up with Harrison’s Gloucester career? Thanks for this feedback, Derek – we’ll get our statisticians on to this!